An attractively-situated strip of pebble beach below the hillside village Nerano, this low-key bathing spot has been developed in recent years. Back in 2006 a Guardian journalist wrote that there were two pensioni and three restaurants here. There are more now, including the white wedding-cake Punta Campanella Resort Hotel, behind the beach, which is an ominous reminder of the ongoing development along this coastline. However, at the time of writing, the atmosphere is still low-key and unpretentious. Families sit on the beach or rent sunbeds, and along the back of the beach is a choice of simple trattorie and café-bars. The picturesque is combined with practicality in Marina del Cantone; boats are stored among the stilts supporting wooden restaurant terraces. 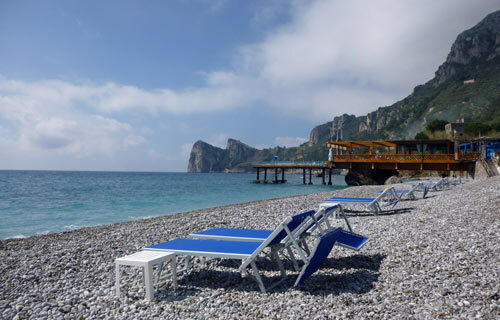 When foreign holidaymakers overwhelm the famous resorts on the Sorrentine peninsula, Marina del Cantone is a refuge for Italian locals and travellers-in-the-know who'll drive over the hills from Sorrento, or take a boat along the coast, to enjoy a swim and a good lunch. Apparently Rudolf Nureyev used to visit when staying in his Galli island home. You can expect to eat well here, and in fact two of the restaurants have Michelin stars. Though it does get busy in summer, the beach here is still a world away from the crowded lanes and seashores nearby. Positano is the last of the well-known destinations on the Amalfi coast heading westwards and despite being on the same coastline, Marina del Cantone has a very different atmosphere. Administratively Marina del Cantone falls within the council (comune) district of Massa Lubrense, although the town of Massa Lubrense lies over on the northern side of the peninsula. 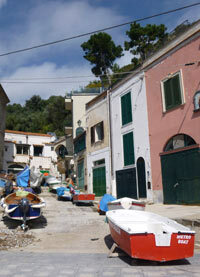 The settlement down here in the bay was a fishing hamlet, the seaside 'quarter' of Nerano. So if you're looking up accommodation or businesses nearby, you're more likely to see 'Massa Lubrense' or 'Nerano' in the address than 'Marina del Cantone'. Check a map to be sure of location. There are a couple of bars along the back of the beach, places you can buy ice creams or an ice granita drink, and restaurants which are mostly seasonal and informal. A local speciality is spaghetti alla Nerano, a dish of spaghetti with courgette and cheese which originated in the kitchen of Ristorante Maria Grazia. The Taverna del Capitano and Quattro Passi have Michelin stars. Closest to the bus stop is the unpretentious L'Africano stabilimento where you can drink or eat snacks on the café's wooden terrace, or rent sunbeds on the beach. A number of the beach businesses offer sun-loungers (lettini) and parasols for rental. It's a worthwhile expenditure if you want to be comfortable. If you only plan to stay a short time, or arrive late in the day, you may be able to negotiate a cheaper price. Apart from relaxing on the beach, and eating spaghetti, one of the best things to do here is to take a short walk along the coast to the next little bay, Recommone. This is described below and is a lovely outing. To walk in the other direction, towards the renowned beauty spot of Ieranto, you'll first need to climb to the village of Nerano above, by catching the bus or following an easy path uphill from alongside the car park (20-30 mins, be prepared for a local dog or two to accompany you). The footpath from Nerano to the bay of Ieranto is clearly marked. This too is a beautiful path and an interesting longer excursion, with the option of a steep drop down to a charming little beach. Marina del Cantone makes a very easy and refreshing excursion from Sorrento; worlds away from the crowded tourist streets of the busy town. Visiting outside peak summer season makes it particularly piquant and atmospheric. Note that my pictures were taken in spring. In the summer the beach will be much more crowded with sunbeds, parasols and sun-lovers. You can visit easily by bus - but note that the hairpin bends may make the hour-long trip uncomfortable for those inclined to travel sickness. At the left-hand end of the beach as you face the sea, a glorious little footpath leads to an even more idyllic bay. Starting in unpromising fashion behind the last restaurant, this route turns into a beautiful and easy taster to Amalfi Coast walking. There are places to sit, flowers, butterflies, birds, olive trees, a ruined watchtower and lovely views of the sea, the coast and the Galli islands. If you want to take it easy, there's no need to descend the final rough steps into the bay at Recommone; you could just admire the view and retrace your steps. The path at Recommone emerges into a boatyard by a house. Through a gateway you come onto the small beach, which is a mixture of pebbles, grit, sand and Mediterranean detritus, from ceramic shards to shells. On the far side of the bay is the idyllic hotel-restaurant-beach club La Conca del Sogno. Terraces on the rocks, built for sun-loungers and dinner tables, give a view of nearby islets, the more distant Galli and of the bay beyond protected by cliffs. The expression 'a hidden gem' was designed for a place like this. 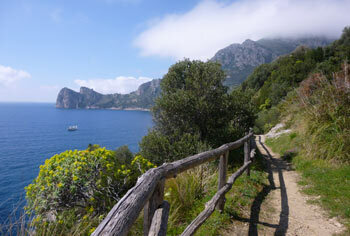 The walk from Marina del Cantone to Recommone only takes 15-20 minutes. Whether or not you descend to Recommone for lunch or out of curiosity, I'd recommend following at least part of the path just to experience the natural beauty of the landscape and seashore. Considering how out-of-the-way Marina del Cantone feels, it is remarkably straightforward to reach. 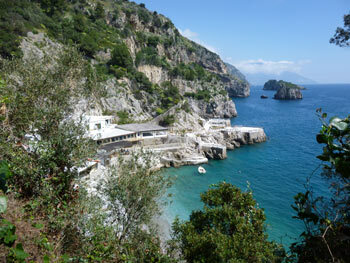 Regular buses (run by Sitasud) operate between Sorrento and Marina del Cantone. The routes vary - sometimes via Massa Lubrense and sometimes via Sant'Agata. In Sorrento the buses depart from outside the Circumvesuviana station, and they also stop at Via degli Aranci (if staying at the western end of Sorrento, ask at your accommodation for the nearest bus stop). Buy your tickets before boarding, from Sitasud sales staff at the station, and some tabacchi shops, including one at Marina del Cantone. On some bus services (whatever the timetable may claim) you might have to change buses at Sant'Agata - check with the driver. The bus also stops in the centre of Nerano, and most services stop in the village of Termini, so it makes it easy to plan a day of combined walking and beach life. Timetables are available locally and online. (See links panel, and look under orari for the Sorrento area. The bay is listed as Nerano Cantone.) There's a car park in the bay. There is accommodation available at Marina del Cantone, with a choice of simple hotels, B&Bs and holiday villas and apartments. Marina del Cantone is an out-of-the-way place to hole up for a few days and enjoy walks along the coast, trying the different restaurants, and beach life in general. If you want to unwind, write a novel or meditate, staying here or in Recommone could be ideal - though in that case it would probably be best to avoid the height of summer. As this is a remote spot near the end of the peninsula and the only road access is via a long zigzag route up to Nerano and Sant'Agata this isn't the best base for longer-distance sightseeing even if you have a car - though it is possible. If you want to stay here and also see more of the area, I'd recommend a short stay here and then moving on. > La Conca del Sogno - glorious isolation in the bay of Recommone. > Locanda del Capitano family-run, with a Michelin-star restaurant. > Lo Scoglio - right by the sea, with a restaurant built out over the beach. > Punta Campanella Resort big, modern hotel across the road from the beach. > L'Oblò - seafront holiday home. 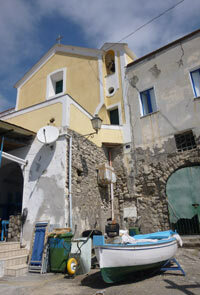 > Mimì sul Mare - self-catering apartments by the beach.